Will prevent you from completing the most urgent and important tasks in the heroes lives with the same strength as when they try to bring like poles of a magnet together. The Procrastinator is a monster that, eventually, will lead you to your death, slowly and steadily. Not with power, but with the maddening ability to get things done in the last possible minute. When you encounter this scourge, do not be fooled, take quick action and look like you are on an important mission (which of course you are), for nothing hurts the Procrastinator more than having that 'I'm on a mission' look. 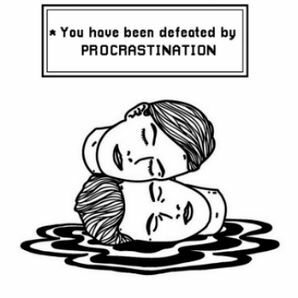 Currently there are no reports of the attacks used by the Procrastinator (no one has survived an attack of a Procrastinator in full action mode, yet), if you happen to be one of the lucky ones, do write about it and how you survived it. Increase of anxiety: The stress of juggling deferred tasks increases the risk of mental health challenges in susceptible individuals. Increase of fatigue: Sleep deprivation and rushing to keep up with deadlines lead to both physical and mental exhaustion. Lowering of self-esteem: Procrastination often causes underperformance, in turn triggering feelings of self-doubt and worthlessness. Unknown weaknesses. Believed to be omnipotent, omniscient and omnipresent. Engage with it during your power hour. Find the hour that makes you feel at your very best, at your most optimal mode of functioning, and set aside the time to do your most urgent and demanding tasks then. Perform the most challenging and demanding task first, the most likely to have you procrastinating over it. Set specific goals. Tasks seem threatening when they are broad and vaguely-defined. Deciding to “Watch this quest complete itself” is just another way of saying, “Someone will do it for me”. Reward yourself. Celebrate small victories for having completed your tasks. The reward may be wasting 3/4 of your money on beer. Let your brain know that you will reward it for focusing and being attentive. Don't punish yourself. Your god/goddess is there for that.